Click on a title to view film. Meyer's House, the Victorian gem of the Alameda Museum, celebrated all the folks who volunteered time and money to fix up the estate by holding an outdoor festival on the grounds. This 3 minute 40 second slideshow presentation vividly shows just how lovely the outside has become. For more information, see the Meyer's House website. This 37 minute 21 second slideshow presents highlights from the late afternoon rally. On the eve of the anniversary of the "Citizen's United" Supreme Court decision that gave corporations the rights of people, citizens vowed to shut down Wall Street West in San Francisco in protest of corporate injustice distorting our lives. During the Occupy Wall Street West demonstration in San Francisco, antiwar allies including Global Exchange, Iraq Veterans Against the War, Seminary of the Street, Veterans for Peace, Courage to Resist, Code Pink, the Fellowship of Reconciliation, March Forward!, the Iraqi Student Project of Dominican University, and the Campaign for New Priorities targeted Bechtel Corporation. In spite of rough weather, groups united in their protest of the waste and corruption of the Bechtel Group and the ways that its power has distorted our nation's budget priorities. On the afternoon of the Occupy Wall Street West demonstration, protestors conducted a teach-in on Bechtel Corporation's doorstep. Speakers described the waste, corruption, and public endangerment that Bechtel causes. Iraq Veterans Against the War demonstrated at the end of the teach-in how military detentions of ordinary citizens could occur in the U.S. just as they are commonly perpetrated against people in other countries. In an extraordinary speech given during the Teach-In, a veteran calls on comrades in the military to stop war that benefits only the 1% at the expense of the rest of us by just saying NO. People in Oakland rallied and marched to demand economic justice and an end to wars that are bleeding us dry. On Saturday, October 15, 2011 the city's streets echoed with cries of "healthcare not warfare!" and "banks got bailed out, we got sold out!" as more than 2000 "Jobs Not Cuts" demonstrators marched out from a rally at Laney College demanding basic economic justice. The march moved along Eighth Street toClay Street and then onto Frank Ogawa Plaza in front of Oakland's City Hall, where it merged with the Occupy Oakland protest that's been encamped there since Monday, October 10, 2011. More speakers rallied the crowd, including featured speaker, Danny Glover. On Saturday, October 15, 2011 more than 2000 "Jobs Not Cuts" demonstrators marched out from a rally at Laney College to City Hall demanding basic economic justice. The march moved along Eighth Street to Clay Street and then on to Frank Ogawa Plaza in front of Oakland's City Hall, where it merged with the Occupy Oakland protest that's been encamped there since Monday, October 10, 2011. Danny Glover climaxed the day's events. This 9 minute 53 second video shows all of Danny's speech. Speakers presented information about the state of the American Labor Movement, focusing on struggles for democratic organization in California: Arthur Lipow, president of the Forum; Sal Rosselli, interim president of the National Union of Health Workers; Steve Early, author of "Civil Wars in U.S. Labor;" Carl Fenimore, labor activist, recently returned from witnessing revolutionary events in Egypt; and Cal Winslow, labor educator, author of "Labor's Civil War in California." The presentation was 50 minutes and 30 seconds long. You can obtain this DVD from APAF as well as a double audio CD set recording the complete presentation plus question-and-answer session that followed. Click here to view the APAF website. This community meeting was held on August 26, 2010 in the Alameda Point Theatre. 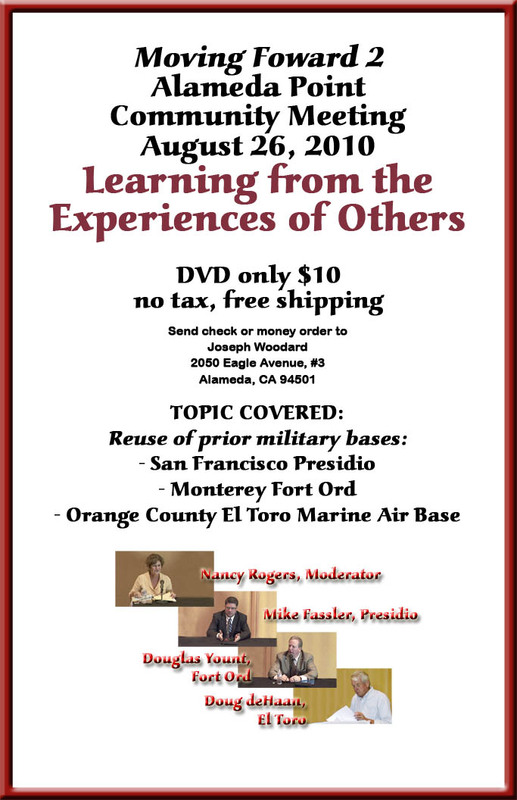 Presenters discussed reuse experiences at three former California military bases. Mike Fassler, Assoc. Dir. of Real Estate for the Presidio Trust described reuse of San Francisco's Presidio Army Base. Douglas Yount, Director of Strategic Development, described reuse of Monterey's Fort Ord Army Base. Doug deHaan, Alameda's Vice Mayor, described reuse of Orange County's El Toro Marine Air Base. The three different types of solutions offer a range of ideas for Alamedans to consider when moving ahead with their reuse of the former Naval Air Station in Alameda Point. A 40 minute question-and-answer session followed the presentations. Community members had some interesting, probing questions. 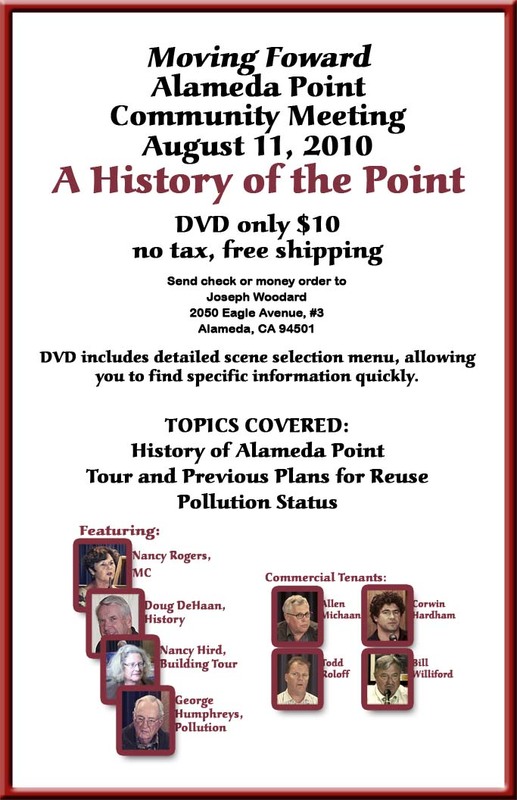 Handouts from the meeting are included on the DVD, along with a pollution map. Held August 11, 2010 in the Alameda Naval Air Museum, this meeting considered the history of Alameda Point, previous plans for its development including the community-based reuse plan, pollution status, and the experiences of four commercial tenants. The moderator was Nancy Rogers. Speakers included Doug DeHaan, Vice Mayor; Nancy Hird of the Alameda Architectural Preservation Society; George Humphreys from the Restoration Advisory Board; Allen Mischaan, CEO of Mischaan's Auctions; Todd Roloff, VPO of NRC Environmental Services; Corwin Hardham, CEO of Makani Power, Inc.; and Bill Williford, CEO of Rock Wall Wine Company.